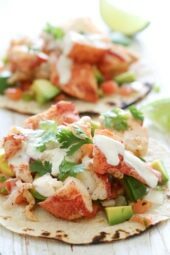 These lobster tacos are made with steamed chunks of lobster meat lightly seasoned with Old Bay, avocado and pico de gallo, topped with a spicy poblano crema. 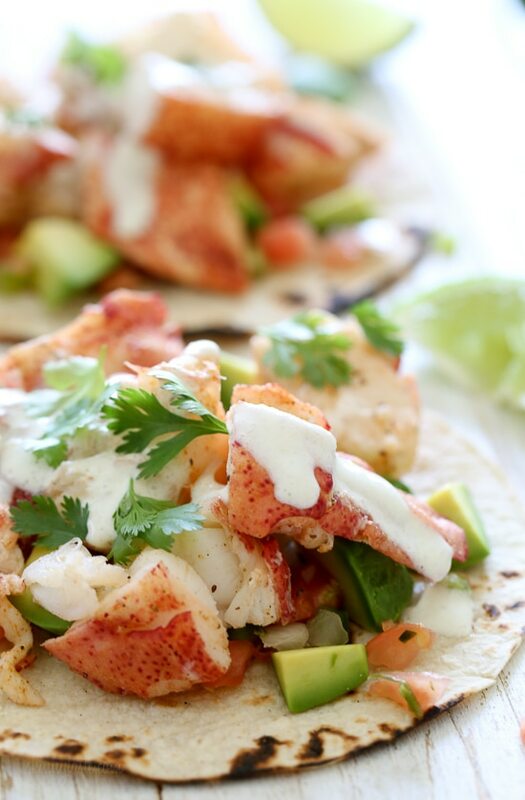 If you want to step up your fish taco game, you need these in your life! Last weekend, I co-hosted a retreat in the Hampton’s with Lexi and Liz for a group of 15 people, including myself. One of the restaurants we lunched at was Union Cantina in South Hampton, where we enjoyed lots of salsa, guacamole, ceviche, tacos, sangria and more! So much great food, with a great staff and fun atmosphere. 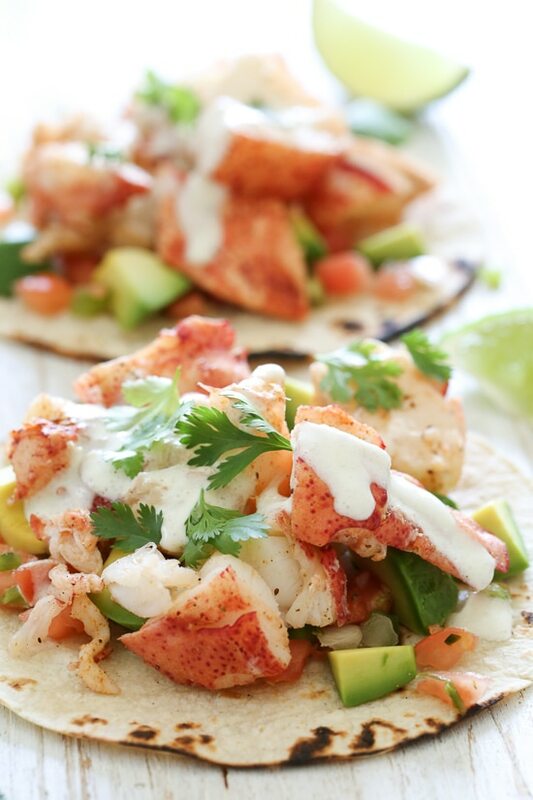 Everything on the menu was wonderful, but these lobster tacos took the prize! So fresh, and light, with just a hint of spice in the cream, I loved them and had to get the recipe. The chef at Union Cantina was kind enough to share, which I modified slightly for the home cook. I have access to fresh lobster here on Long Island, but if that’s not an option by you, you can use lump crab meat instead. Hope you enjoy!! 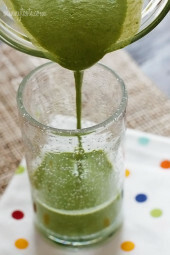 For the Lime roasted poblano cream, place all in food processor until blended well. Season chilled lobster meat with old bay and fresh ground black pepper, to taste. 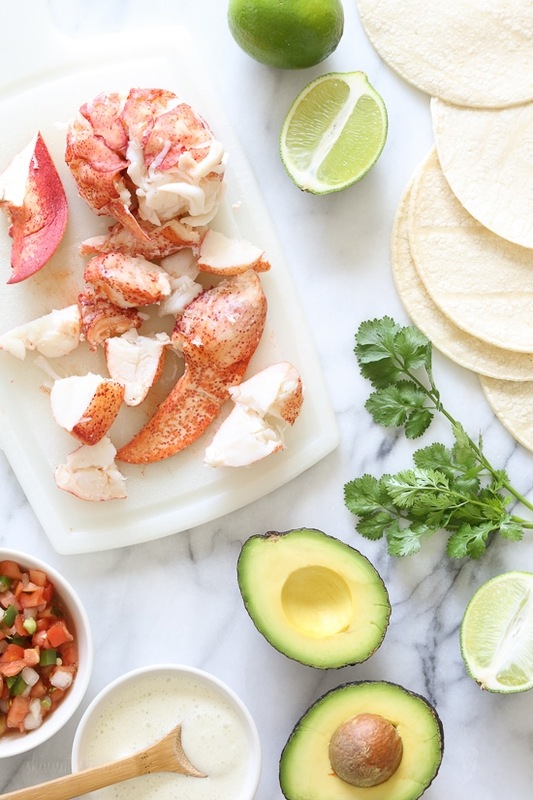 To assemble, top each tortilla with 1/2 oz avocado, 1 tablespoon pico de gallo, 2 1/2 oz lobster meat, 1 tsp of poblano cream and garnish with cilantro or micro greens. I used shrimp instead and kept the rest of the recipe exactly as is… it was super tasty! Hello, Can I replace the sour cream with plain Greek yogurt? Would this work as well w flour tortillas? Looks yummy – thanks! Looks yummy tho picture looks like flour tortillas would they work well too? Also would shrimp work well too for variety? Thanks! I don’t really have access to fresh lobsters. Is anything other type of lobster acceptable? It’s Ash Wednesday and Valentine’s Day and I didn’t have lobster but substituted shrimp and it was delicious!! So excited to find this recipe since I have 2 lbs of cooked lobster tail to use. 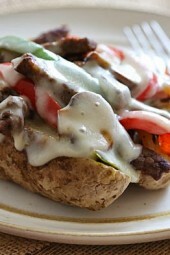 I will make these for our Valentine Dinner! Hoping someone can answer the question of what size corn tortillas to use. We’re on WW so it’s a question that may not be important to most but is to us when figuring how to get to the 5 FSP. Thanks so much. My guess is 6″. You get two of those for 3 points. 1 oz. avocado is 1 point and my guess is 2 tsp of the sauce is the last point. These tacos were awesome! My husband and I have a taco night once a week. We like to try different fillings and I just happened to have some lobster tails in the freezer. We followed the recipe as is. So easy and fast to prepare. Love the poblano cream sauce. We also made the recipe for Easy No-Cook Salsa. Will never buy salsa again. Definitely will be making this again-a new favorite. I had lobster meat shipped in from maine for this recipe. 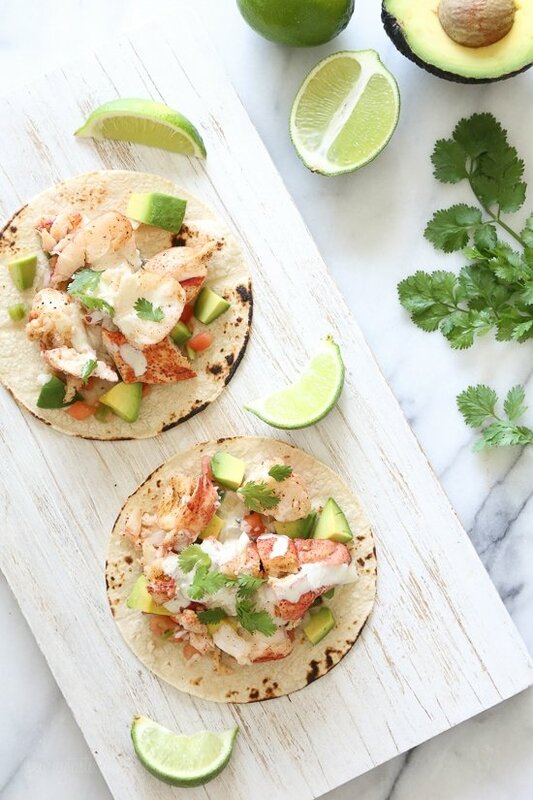 Is the lobster meat supposed to be cold in these tacos? It says chilled lobster meat? Seems odd for cold meat in a taco…so just wanted to confirm? SO DELICIOUS! It took awhile to make but so worth it. 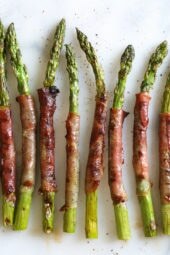 I made these tonight and me and my husband loved them! The poblano sauce was not very spicy so I added more pepper to mine. And made corn tortillas from scratch. So yummy! Thanks for the recipe. Do you have a recipe for steaming lobster? I cheat and have them steam it at my local fish monger. I like that you cheat. Lol. Steaming is so easy 8 minutes. Look up steaming lobsters on the internet. Allrecipes comes up. works perfect. If I cant find fresh whole lobster, can I use fresh frozen lobster meat from the seafood section in the grocery store? I can’t eat hot/spicy foods. Is the poblano pepper fairly mild, or would the recipe be just as tasty if I left it out altogether? I don’t do spice either, but found the pepper extremely mild. Flavorful, but no heat. I think the heat can vary in poblanos. You could buy one & try it. How about a recipe for ceviche? When you roast the poblano pepper, do you keep it whole (recipe says “with seeds” but I’m wondering whether you have to halve it or something.) And after it’s roasted, do you remove the seeds, or does the whole thing go in the processor? These tacos look amazing! Thank you for sharing! I put it all in the food processor so it’s a little spicy. The whole pepper or just 1/4 of the pepper into the blender? Hi, Gina – I am a fish taco fiend, so thank you for this version. Unfortunately, I am one of those -cilantro-tastes-like-soap people and end up leaving it out of every recipe. No matter how many times I think I can get over it, I cannot. Please recommend a substitute, if there even is such a thing! Der. Of course! Thank you! How do you keep your tortillas from cracking/crumbling? I heat them directly over the fire until the brown. Looks and sounds good but the sodium seems really high!!! Looks soooo good. Going to make these! I just moved to Maine and I absolutely cannot wait to try these! They look delectable! These sound absolutely incredible!! I need to try them!